High capacity and amazing tranfer rates Fujifilm's NANOCUBIC technology realized LTO G4 data cartridge to have capacity of 1.6 TB (at 2:1 compression; 800GB native by recording 896 tracks within 12.65mm tape width. Also with utilization of multi-channel recording technology. 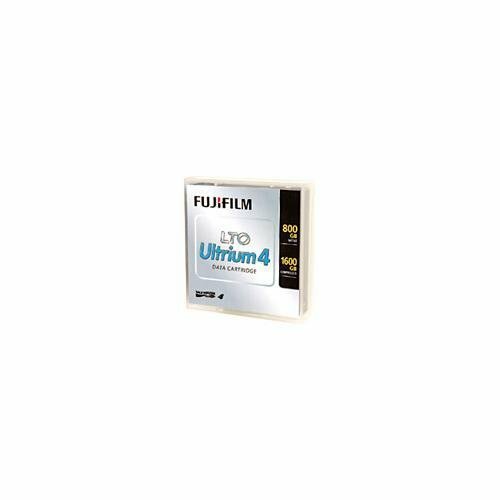 LTO G4 data cartridge featured tranfer rates of up to 240MB/sec. (at2.1 compression; 120MB/sec. native) Enhanced durability NANOCUBIC technology improves the smoothness of tape-surface, which helps extend the head-lifetime and outputs high durability by the decrease of error even in rigorous use. Encrypted For Security LTO Gen 4 systems will introduce for the first time to midrange tape storage the Advanced Encryption Standard (AES) 256-bit encryption algorithms to keep data secure. The hardware-based AES-256-bit encryption capability of the Gen 4 format offers higher level of securtiy during storage and transporting of sensitive information. If you have any questions about this product by Fujifilm, contact us by completing and submitting the form below. If you are looking for a specif part number, please include it with your message.